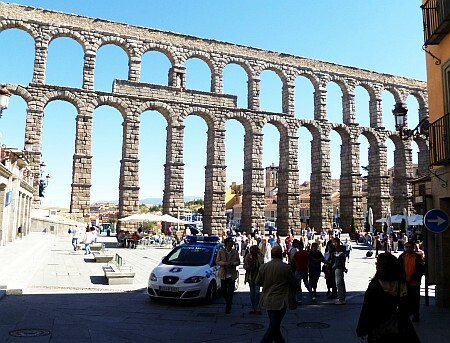 The city of Segovia, Spain has one of the best preserved Roman aqueducts in Europe constructed in the 1st century AD. The aqueduct is still standing today due to superb Roman engineering and the fact that the unmortared granite blocks endure weathering better than limestone. The aqueduct was designed to transport water from Fuente Fría river, approximately 17 km (11 mi) from the city. 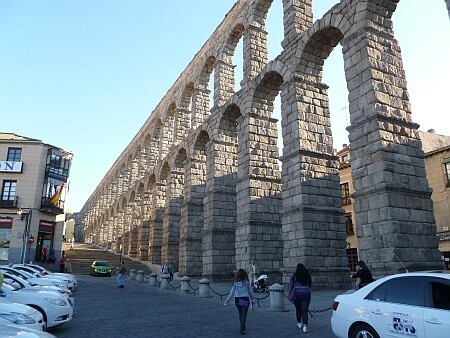 The 75 single arches and 44 double arches of the aqueduct reach a spectacular height of 28.5 m (93 ft 6 in). Segovia is located approximately 90 km ( mi) northwest of Madrid in the center of the Iberian peninsula. The town was captured from the Celts by the Romans approximately in 75 BC. Segovia became an important trade center in textiles with a growing Jewish population during the middle ages. In 1474, Isabella I was proclaimed queen of Castile in the church of San Miguel de Segovia on December 13, 1474. Isabella managed to reduce the animosities between Christians and Jews by forcing many Jews to convert to Catholicism. The success of Segovia as a wool and textile center brought prosperity. Segovia had a population of approximately 27,000 in 1574, but its population was only 8,000 one hundred years later as a result of economic decline. The modern Segovia has a population of over 56,000 inhabitants and it is a popular tourist destination. The granite stones were carved with great precision. 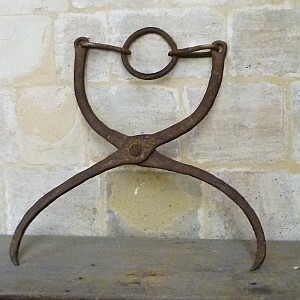 The photograph above shows that small indentations were made on each of the stones so that they could be elevated to their proper position with the iron pincers. 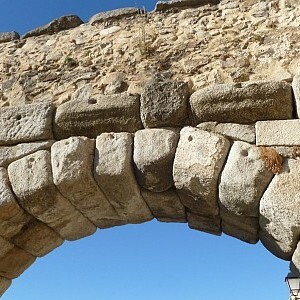 The position of the indentations is such that the stone would hang at the correct angle for placement in the arch. 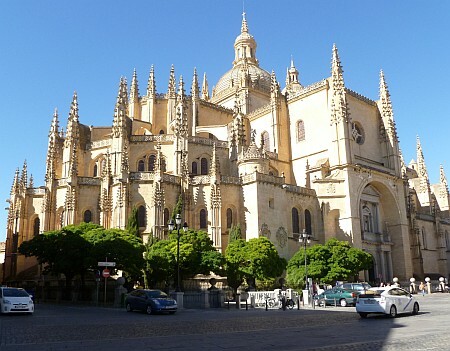 The Segovia Cathedral is one of the most spectacular buildings of the city. The Gothic style cathedral was built between 1525-1577, and its ceiling has a height of 33 meters. 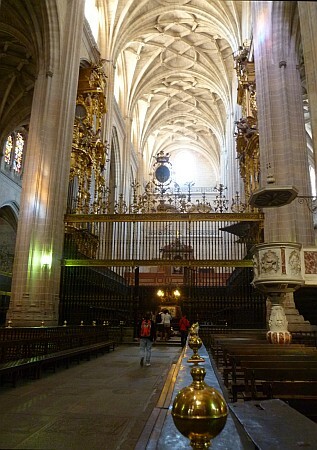 Many Spanish cities have an abundance of churches constructed at various times and in different styles. Patrons supported the construction of churches to demonstrate their devotion to Christianity and avoid persecution by the Papal Inquisitions of the Catholic church. 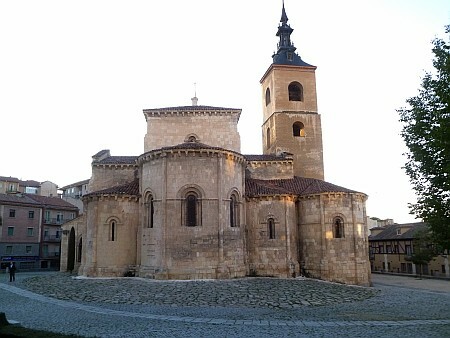 The Romanesque San Millán church was built in the 12th century. 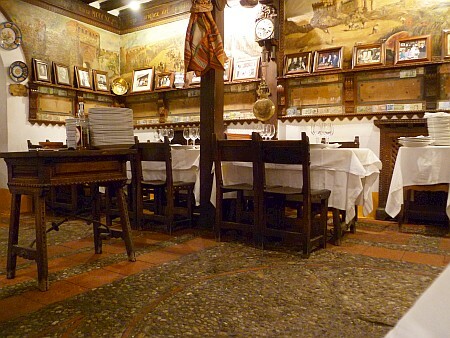 I had dinner at the Meson de Cándido restaurant in Segovia which is located next to the aqueduct. 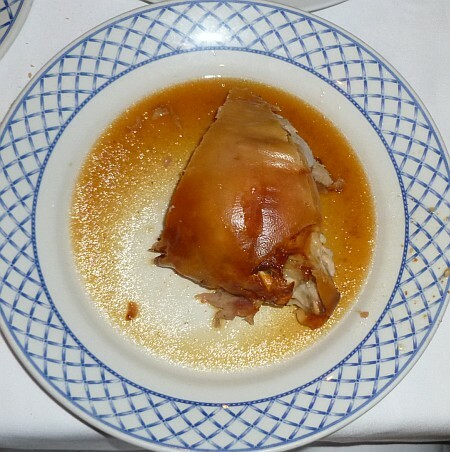 The roast piglet which is a specialty of the house had a crispy crust and was tender and moist, but I was disappointed that for €21.60 euros the plate was just a medium-sized serving of meat that did not come with any garnish, not even a spoonful of peas or a potato. The restaurant is definitely overrated and overpriced. Mesón de Cándido roast pig - No garnish of any kind?! 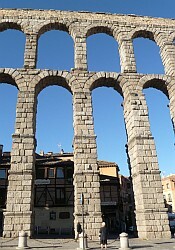 Segovia is an interesting city, but it is somewhat overpriced because of the large number of tourists. The local residents are very helpful at giving directions and are proud to live in this city. Segovia is a city for walking. Only local automobiles and taxis are allowed in the city.